North Vancouver commercial traveler killed in the explosion in Car 1586. Not a Doukhobor but instead a Russian Jew, Baskin nonetheless served as aide and interpreter for Peter V. Verigin. Several years after Lordly’s death he ceased to work within the Doukhobor commune and established his own lumber business, based in Nelson. A popular Nelson athlete and businessman, killed in explosion in Car 1586. CPR Engineer who traveled on Train 11 from Nelson to Farron to relieve a sick engineer. He was not on the train at the time of the explosion, but had made observations about passengers on it up to his departure at Farron. He did not testify to either of the two inquests into the deaths of passengers on the train, and only in 1931 was he questioned by the B.C. Provincial Police, to whom he gave a statement. The Assistant Deputy Minister for Police Services of the B.C. Ministry of the Attorney General who chaired the meetings of the Expanded Kootenay Committee on Intergroup Relations from 1982 to 1985. Bourne had extensive experience in policing and security intelligence matters both with the B.C. and Canadian governments. CPR car foreman based in Nelson who investigated the Pintsch gas tanks on Car 1586 after the explosion. Train baggageman on Train 11 on October 28-29, 1924. A businessman based in Sand Point, Idaho who represented the Bruce Lumber Company, Campbell was killed in the explosion in Car 1586. Vice-president of the CCUB under Peter V. Verigin. Rumor immediately after Verigin’s death suggested that Cazakoff, like Joseph Shukin and Larion Verigin, favored Anastasia Holubova’s bid to lead the commune in December 1924. Whatever the merit of the rumour, Anastasia’s claim to leadership failed. In December 1924 Cazakoff and Joseph Shukin were chosen to manage the CCUB until the arrival of Peter P. Verigin, with Cazakoff as acting chairman of it. News articles immediately after the explosion in Car 1586 reported him to have been in the car and injured in the blast. Police did interview him in the Grand Forks hospital after the incident, but he did not appear in news articles after the first day. Grand Forks watchmaker who testified about the clock found in the vicinity of where the explosion took place and which C.P.R. officials believed was a part of a bomb. CPR assistant general superintendent for British Columbia who investigated the explosion. Canadian Department of Immigration and Colonization Traveling Investigation Officer who in 1930 interviewed Metro Grishin after his arrest by B.C. Provincial Police near Nelson. He interviewed Grishin about his background but apparently did not ask about the 1924 explosion that killed Peter Verigin. Cowell and police released Grishin, a Russian, on his promise to leave Canada. B.C. Provincial Police Inspector based in Nelson who, in the course of investigating reports of Russians among the Doukhobors in 1930, came across Metro Grishin in a Freedomite camp near Nelson. Grishin had been wanted by police in 1924 in connection with the explosion on Car 1586. However, although Cruickshank interviewed Grishin he apparently did not ask him about the 1924 explosion, and released him immediately. Doukhobor commune leader who reported after the explosion that Peter Verigin had been taking precautions to ward off attempts against his life. B.C. Provincial Police Inspector who investigated the explosion. Nelson physician and surgeon who performed post mortem examinations of the bodies of W.J. Armstrong, Mary Strelaeff and Neil Murray. Vancouver-based news agent killed in the explosion in Car 1586. B.C. Provincial Police Staff Sergeant based at Greenwood who investigated the explosion in Car 1586. B.C. Provincial Police Staff Sergeant based in Nelson who investigated the explosion in Car 1586 and was present when CPR Constable House found parts of a dry cell and clock on the scene that CPR and police suspected were parts of an explosive device. A salesman from Spokane, Gaskill was in Car 1586 at the time of the explosion and was injured by it. Alias Dan Grenor, Dmytre Grenchuk, Jim Mitgren, Mit Graen, Mit Gren, Grishin is one of the elusive characters who lived either on the fringes of Doukhobor society or fully among them over the century of their residence in Canada. From 1908 to the 1970s, various “visionaries,” outcasts and misfits have gravitated to the Doukhobors, the Russian Grishin among them. Perhaps the crucial question concerning Grishin is why police identified the watchmaker as a suspect in Verigin’s death just the day after the explosion. And why, given that he was a suspect, was he released from custody after he was picked up by the B.C. Provincial in July 1930? Was there any connection between Grishin and the Dimitri Gretchen who accompanied Verigin himself on the latter’s extended trip to Russia in 1906-7? Engineer driving Engine 582 of Train 11 on October 28-9, 1924. One of the entourage of young maidens who accompanied Peter V. Verigin in his travels to Doukhobor villages in Saskatchewan after his arrival in Canada in 1902, Anastasia was 18 when the two met. She quickly became his favorite. Soon she was traveling with him everywhere – to the villages, to the United States, and, in 1906-7, to Russia. Long regarded as his wife, by 1923 she might have had reason to fear a rival for his attention, because Lordly began to be seen and travel with 17-year-old Mary Strelaeff. A 19-year-old Doukhobor youth of Brilliant who wished to leave the Christian Community of Universal Brotherhood and was charged with causing grievous bodily harm to CCUB official John Obetkoff after an altercation over his leaving. Canadian Pacific Railroad constable who arrived at the scene of the explosion eight hours after the incident and who found remains of what appeared to CPR investigators to be a bomb. B.C. Provincial Police Corporal based in Trail who investigated the explosion in Car 1586. Also known as Orange Sam for his occasional practice of wearing a crown of oranges and white robes in public displays, Kamenshikoff was a Russian who worked near and sometimes in the Doukhobor community and who knew Peter Verigin. An Independent Doukhobor who was in Car 1586 at the time of the explosion and was injured in it. B.C. Provincial Police Constable, based in Grand Forks, who investigated the explosion; the first to arrive on the scene, some seven hours after the explosion. Grand Forks medical doctor and coroner for the inquest there into the deaths of John McKie, Peter Verigin, P.J. Campbell and Haakum Singh. Inspector of explosives employed by the Department of Mines of the government of Canada and based in Vancouver. Leach’s duties were to investigate accidents throughout Canada, and he made an examination of the wreck at Farron. Nelson medical doctor and coroner for the inquest there into the deaths of William J. Armstrong, Neil E. Murray, Mary Strelaeff and Henry (Harry) J. Bishop. Born in 1895, Makaroff came from Russia with the Doukhobors in 1899. His father opted to leave the community and became an Independent Doukhobor. Makaroff became the first Doukhobor in Canada to graduate with a law degree (University of Saskatchewan, 1918). CPR Trainman based out of Nelson, on Train 11 at the time of the explosion in Car 1586. Professor of political economy at the University of Toronto and friend of Leo Tolstoy who was one of the key go-betweens in bringing the Doukhobors to Canada in 1899. He urged the federal government to bring them as settlers to Canada and he set out the main conditions under which they could come. They insisted on exemption from military service; they wanted to hold their land communally; and they wanted to be consulted about the form of their children’s education. There was some uncertainty about the land issue, but the two sides believed they had struck a deal, and on that basis the Doukhobors set out for Canada. Mavor would defend the Doukhobors in 1925, when he believed they were being harshly treated by the B.C. government. A member of the B.C. Conservative Party, the 49-year-old McKie had been elected to the B.C. legislature for the Grand Forks-Greenwood riding for the first time in June 1924 and was traveling to Victoria for the opening of the legislature at the time of the explosion in Car 1586. Originally from Scotland, McKie was prominent in the Masonic Order, a secretive group whose members have been prominent in political and business circles through the past three centuries. He was a long-time resident of Grand Forks, where he owned the Boundary Iron Works. 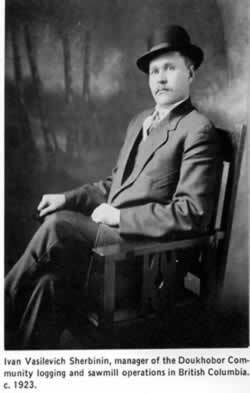 Inspector of the Bureau of Explosives of the American Railway Association, which supervised the safe transportation of explosives and other dangerous articles in Canada, the U.S.A and Mexico. He inspected Car 1586 after the explosion. Grand Forks electrician who examined the dry cell and clock found at the scene of the explosion. CPR Divisional Superintendent based in Nelson, Miller knew Peter Verigin personally. On the scene at Farron just over eight hours after the accident, he ably spoke for the company in the early hours and days, when rumours circulated furiously about the cause of the explosion. A member of the elite of British Columbia, Morrison was a judge of the Supreme Court of B.C. in October 1924 when he presided over the trial of John Hooliaff, who was charged with causing grievous bodily harm against Doukhobor commune official John Obetkoff earlier that year. Mr. Justice Morrison’s observations at the end of the trial that the commune should be squelched provoked ire among the Doukhobors. A native of Nova Scotia, Morrison ventured west to B.C. and practiced law in New Westminster, rising to the status of King’s Counsel (K.C.). As a Liberal, Morrison represented the riding of New Westminster in the Canadian House of Commons from 1896 to 1904, at which time he was appointed a justice of the B.C. Supreme Court. In 1928 he became chief justice of the B.C. Supreme Court. Fireman in Engine 582, Train No. 11 on October 28-29, 1924. General Manager of the CPR western lines, examined Car 1586 about eight hours after the explosion. Grand Forks rancher killed immediately in the explosion. Doukhobor commune official who, in February 1924, went to the home of John Hooliaff to deal with Hooliaff’s request to leave the commune. In the scuffle that ensued, Obetkoff sustained a cut and had Hooliaff charged with causing bodily harm. Montreal Irish-Canadian laborer injured in the explosion in Car 1586. CPR superintendent of motive power for the western territory who examined Car 1586 about eight hours after the explosion. RCMP Detective Staff Sergeant based in Penticton who investigated the explosion. A carpenter living in Trail, Russo was on Car 1586 and injured in the explosion. Injured in the explosion in Car 1586. In Car 1586 at the time of the explosion, but not injured. A passenger in Car 1586 at the time of the explosion and slightly injured in it. Energetic and astute, Sherbinin was sent in 1908 by Peter Verigin to the small B.C. town of Waterloo, where he led the construction of the town (and its renaming to Brilliant) to make it the heart of the Doukhobor commune. Later he would manage the largest sawmill in the Slocan valley, making him an important member of the Christian Community of Universal Brotherhood hierarchy. Secretary to Lordly for years; in December 1924 Shukin was chosen by the community to manage the Christian Community of Universal Brotherhood as secretary-treasurer until the arrival of Peter P. Verigin. When Verigin Junior arrived in Canada in 1927, Shukin continued to serve as secretary. Indo-Canadian who was in Car 1586 at the time of the explosion and injured in it. Indo-Canadian laborer, killed in explosion in Car 1586. Translator for Peter Verigin, he also shared a Nelson apartment with the leader. On the morning of October 29, he was among the first group of Doukhobors to make their way to the explosion site, where he sought out not only the remains of Verigin, but also those of Strelaeff’s niece, Mary, who was traveling with Verigin. Variously known as Mary and Maria, Strelaeff, Strelioff and Streleoff, her death certificate refers to her as Mary Stelaeff, “age about 17.” Beginning about 1923 she became Peter V. Verigin’s frequent travel partner, even while he was in a long-standing common-law marital relationship with Anastasia Holubova. Some Doukhobors at the time (and even today) described Strelaeff as strictly a secretary to Verigin. But it is highly unlikely that she was literate, in Russian or English, since Doukhobor girls rarely went to school. The community did send a small number of boys to public schools, and provincial school officials believed that they did so only to train a new generation of managers for the commune. In any case, Verigin had little need of a new secretary, since he had a coterie of key economic officers in the CCUB and a host of managers who ran local communal enterprises and villages. Of the surviving correspondence of Verigin, none bears any stamp of having been typed, translated or written by Strelaeff. This suggests that Strelaeff was not a secretary and more likely a personal companion of Verigin. CPR Conductor based out of Nelson, on Train 11 at the time of the explosion in Car 1586. Nephew of Peter V. Verigin, Larion Verigin was a member of the leadership core of the commune based at Brilliant in southern B.C. The secretary-treasurer of the KC Jam Factory at Brilliant, he was one of the first group of Doukhobors to arrive at the scene of the explosion in Farron on the morning of October 29. At Lordly’s death, Larion Verigin did not support the plan to invite Lordly’s son, Peter P. Verigin, to become the new Doukhobor leader and instead favored the leadership bid of Anastasia Holubova. News articles in March 1925 reported him to have been fired from his position as secretary treasurer at Brilliant and declared that Holubova’s group was feeling that it was being pushed out of the commune and deprived of any share of it. Anastasia would found an independent colony in Alberta shortly after and would be joined by Larion Verigin. Born in 1882 in Russia, the son of Peter V. Verigin and his estranged wife, Peter P. Verigin did not meet his father until 1902, when the elder Verigin visited him and his mother en route from Siberia to Canada. The next meetings were in 1905 and 1906, when Peter Jr. and his mother traveled to Canada. But Chistiakov (the name means either “The Purger” or “The Cleanser”), as the son came to be called, showed nothing but contempt for his father while in Canada, and his stay was short. Back in Russia, he became the leader of the “Middle Party” of Doukhobors. In 1924, at the death of his father, he was chosen to head the Canadian Doukhobors. Soon imprisoned by the Bolshevik authorities for what they described as hooliganism and as a means to cure his abuse of alcohol, he was able to make his way to Canada only in 1927. There, he became head of the Community Doukhobors until his death in 1939. Nelson explosives expert who commented to the press immediately after the explosion on the type of explosive that might have been involved. In Car 1586 at the time of the explosion, but uninjured. A 12-year-old Doukhobor girl who witnessed an altercation between John Hooliaff and Doukhobor commune officials over the issue of Hooliaff leaving the commune in February 1924. Hooliaff was brought to trial for wounding a commune official, John Obetkoff. Feddossia Zatsoff was called before Peter Verigin before the trial and slapped by him when she described what she had witnessed. A community Doukhobor who was in Car 1586 at the time of the explosion and injured in it. A firm supporter of Peter V. Verigin from the time of Verigin’s Siberian exile, Zibarov arrived in Canada with the first shipload of Doukhobors. He operated the first Doukhobor co-operative store, at Swan River, which closed over disagreements among the Doukhobors about the morality of engaging in business. A trusted lieutenant of Verigin, in 1917, he became one of the founding directors of the Christian Community of Universal Brotherhood Ltd.